Identity Management, Software, Clouds. Mostly geeky stuff. Here is a quick how-to on configuring Oracle Identity Federation (OIF) as the SAML Identity Provider for Salesforce.com. It is easiest if your OIF instance is configured to use POST SAML bindings by default. You can override this on a provider basis but most often you will use POST, so it makes sense to set it as the default.You need a salesforce.com account. Developer accounts are free and support SAML.Create a user in your ldap for testing SAML SSO. We will match on the users "mail" attribute. Set this to a relevant value (testuser@example.com). The mail attribute does not need to match the salesforce.com account id. This example assumes we are using OAM as the authentication engine for OIF, and they both are referencing the same ldap server. Some components of the identity stack need to verify the user connected via SSL. If you are proxying connections through OHS to your OAM servers you can set up OHS to terminate SSL and pass through the connection to OAM (usually running on port 14100). But there is a little trick that is needed to tell Weblogic that the connection is secure - even though it may be coming in over a non secure port (14100). Chris Johnson has a comprehensive write up on SSL offloading which covers the more complex scenario where an external load balancer is doing the termination. The recipe I describe here is for the simpler case where OHS is terminating SSL and forwarding the connections to OAM vi the mod_weblogic plugin. First validate that your Weblogic domain has the Weblogic Plugin enabled (see Chris's article above). I found that it was enabled by default. YMMV. Oracle Access Manger 11G R2 adds SAML Relying Party support as a native feature. You no longer need to stand up and integrate OIF if you want to federate with another IdP. SAML IdP support didn't quite make it into the first OAM R2 release - so you will still need OIF. This is on the roadmap - so stay tuned. In this article I will show how easy it is to set up OAM as a SAML relying party. Great. Now we have a working IdP we can proceed to setting up OAM as a relying party. Oracle Access Manager 11g R2 provides several new REST APIs. This continues a trend to expose key functionality via Web Services. The OAM Mobile and Social service provides APIs for Authentication, Authorization and User Profile services. I will cover those APIs in a future article (have a look here for examples) - but today I want to focus on the policy management APIs. curl -u USER:PASSWORD http://<SERVER>:<PORT>/oam/services/rest/11.1.2.0.0/ssa/policyadmin/resource?appdomain="IAM Suite"
In the process of creating a demo VirtualBox image running OEL 6 and the Oracle database 11.2.0.3.0 I noticed the idle CPU consumption was quite high (8% on the guest, 35% on the host). The culprit turned out to be the Oracle database vktm process. This is a time keeping process - and it calls gettimeofday() *very* frequently. This can have a negative performance impact in virtualized environments. This removes the vktm process from the list of high priority processes. After this change (you need to bounce the database) the idle CPU consumption comes down to 1-2% or so. A nice improvement! b) Probably dangerous. This will most certainly break things in the database - such as statistics, auditing, etc. TL;DR: If you can't ssh using a public key, it could be a SELinux thing. Logging in to a server with ssh using your public key is pretty handy. While setting up an OEL 6 VM I ran into a strange error where sshd would not let me log in with a public key, even though my key was in ~oracle/.ssh/authorized_keys. Password logins worked just fine. Somewhat puzzling: I could ssh into the root account using my public key and without a password. Nine times out of ten, this is a permission problem. Sshd is picky about the permissions on your home directory, ~/.ssh, and the authorized_keys file. I carefully checked this over - but in this instance permissions were not the problem. 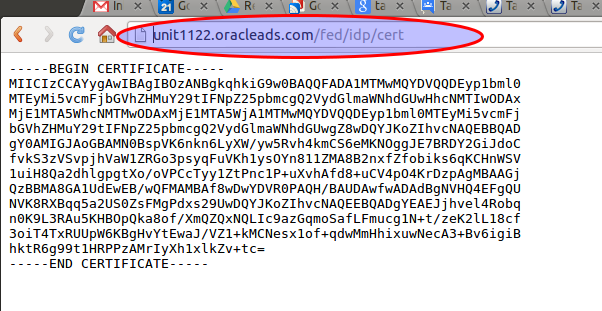 Oracle Identity Federation: Federate yourself! A customer asked me how they could test their OIF IdP configuration without standing up another relying party. Since OIF can act in both roles (IdP and SP), in turns out you can configure OIF to federate against itself. It's seems somewhat crazy, and its not all that intuitive, so I thought I would include a few notes on how to set this up. The key is that you must export OIFs SP and IdP metadata and re-import it back into OIF as configured federations. The "/fed/user/testspsso" test page can be then be used to initiate the federation. Here are the basics of how to accomplish this. Step 1: Export your SP and IdP metadata. This is done from the em console. Do you frequently need to setup new instances of Oracle Linux to host the database, Weblogic, and IAM Middleware? I nabbed some great scripts from my colleagues Chris Johnson (of Fusion Security fame) and Art Mattson. I threw in a couple of my own scripts (great artists steal, right? ), and have assembled these as a github project. Standard disclaimer: These scripts come with no warranty. Use at your own risk! If you have some useful scripts that you would like to contribute drop me a line. Oracle Identity Federation (OIF) provides SAML and OpenId federation services. OIF helps organizations to leverage SAAS as part of their IT strategy by providing identity federation. As part of a recent POC we completed an OIF integration with Service-Now, a cloud base IT Service management platform. John Andersen is a rock star consultant from Service-Now who worked with me on the integration. We have documented the procedure and included a few screen shots (see link below). Your environment will be a little different - but this recipe should get you going. Comments or corrections are welcome!